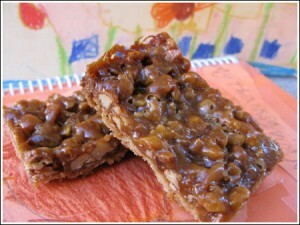 Brown Sugar & Honey Pecan Bars are made without any eggs. Preheat oven to 350 degrees F. Line an 8 inch metal pan with non-stick foil or line with regular foil and spray with baking spray. Prepare crust. Combine flour, brown sugar and salt in food processor and pulse 3 times to mix. Add butter and process until mixture is crumbly – it will be really dry. Pour over bottom of pan and press tightly. Bake for 20 minutes. Prepare the filling. In a heavy saucepan melt the butter. When the butter is completely melted, stir in salt, brown sugar and honey. Simmer mixture for 1 minute. Remove from heat and stir in cream, vanilla and pecans. Pour the pecan mixture over crust and spread evenly. Bake on center rack for 18 minutes. Remove from oven and let cool on a rack for at least an hour. To quick-cool, let them cool down as much as possible then shove them in the refrigerator. Lift foil from pan and carefully cut into bars. I like to trim off the edges, cut the bars into 8 rectangles, then cut each rectangle into a square. It’s easy to do this if you have a big cutting board and a Chef’s knife.